Sunday July 3rd 1921 Still very warm. Harry & Mabel drove in about ten oclock. We all rested in afternoon. Late in the day Harry Mable and Edith went out to Browns. spent the evening on the porch. 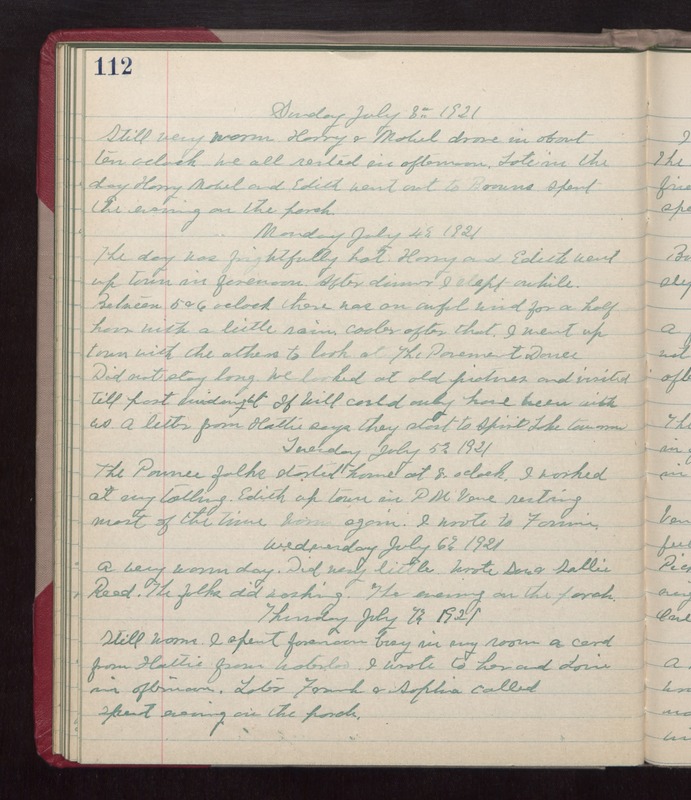 Monday July 4th 1921 The day was fairly frightfully hot. Harry and Edith went up town in forenoon. After dinner I slept awhile. Between 5 & 6 oclock there was an awful wind for a half hour with a little rain. Cooler after that. I went up town with the others to look at The Pavement Dance. Did not stay long. We looked at old pictures and visited till past midnight. If Will could only have been with us. A letter from Hattie says they start to Spirit Lake tomorrow. Tuesday July 5th 1921 The Pawnee folks started home at 8 oclock. I worked at my tatting. Edith up town in PM. Vene resting most of the time. Warm again. I wrote to Fannie. Wednesday July 6th 1921 A very warm day. Did very little. Wrote Sue & Sallie Reed. The folks did washing. The evening on the porch. Thursday July 7th 1921 Still warm. I spent forenoon buys in my room. A card from Hattie from Waterloo. I wrote to her and Lorie in afternoon. Later Frank & Sophie called. Spent evening on the porch.